3 Garnets & 2 Sapphires: SwimWays End of the Summer Sale . . . Every Item 20-70% Off! SwimWays End of the Summer Sale . . . Every Item 20-70% Off! If you own a pool, now is the time to stock up on new pool and swim accessories for next year. 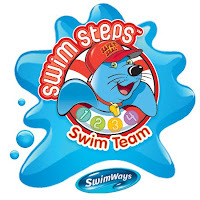 SwimWays, a leader in the pool and swim products industry, has put every single item on sale. You can save up to 70% off on everything you need in pool toys, pool floats, pool decor, plus all you need to start or continue your child's swim training. One of SwimWays' featured products during this end-of-the-season sale is this Jet Valve inflatable Spring Float Recliner. This recliner has a headrest, footrest, and a cup holder and is sized for adults. During the sale, the Spring Float Recliner is priced at $35.95 (regularly $45.95) for all 3 available colors. 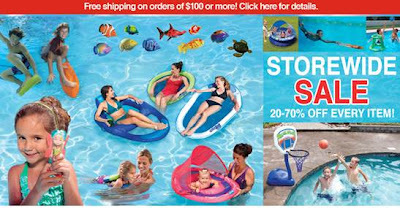 The SwimWays Storewide Sale is going on now through Labor Day 2011. On top of reduced prices on every item, you can also receive Free Shipping within the continental U.S. when you spend $100 or more.